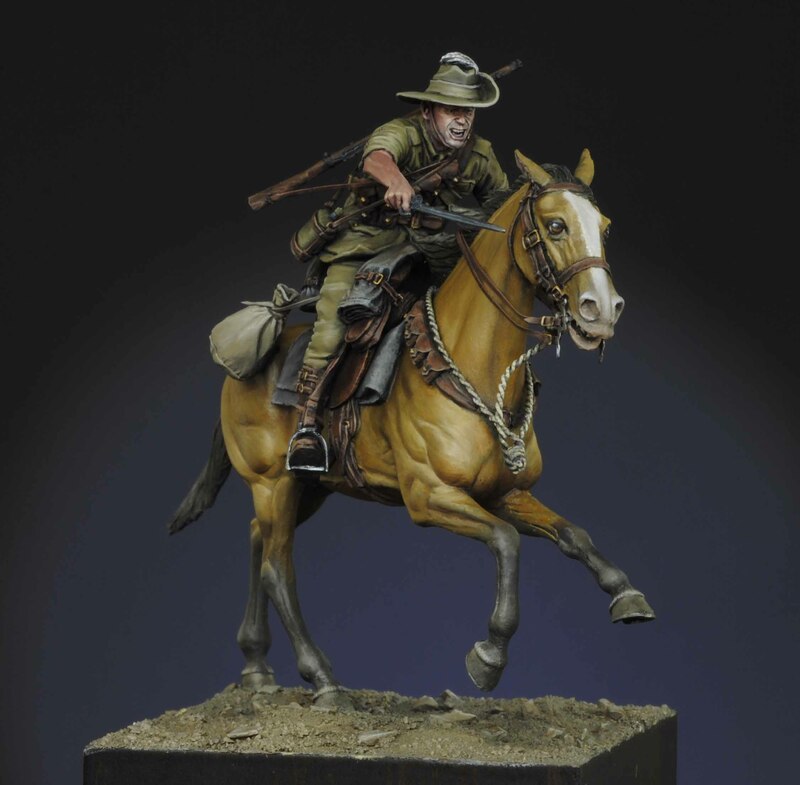 As soon as I’d released TW32C02 the Trooper of the Warwickshire Yeomanry in 2016 I was immediately asked if a mounted figure of the Light Horse would be included in the range, so I’m delighted to be able to oblige! 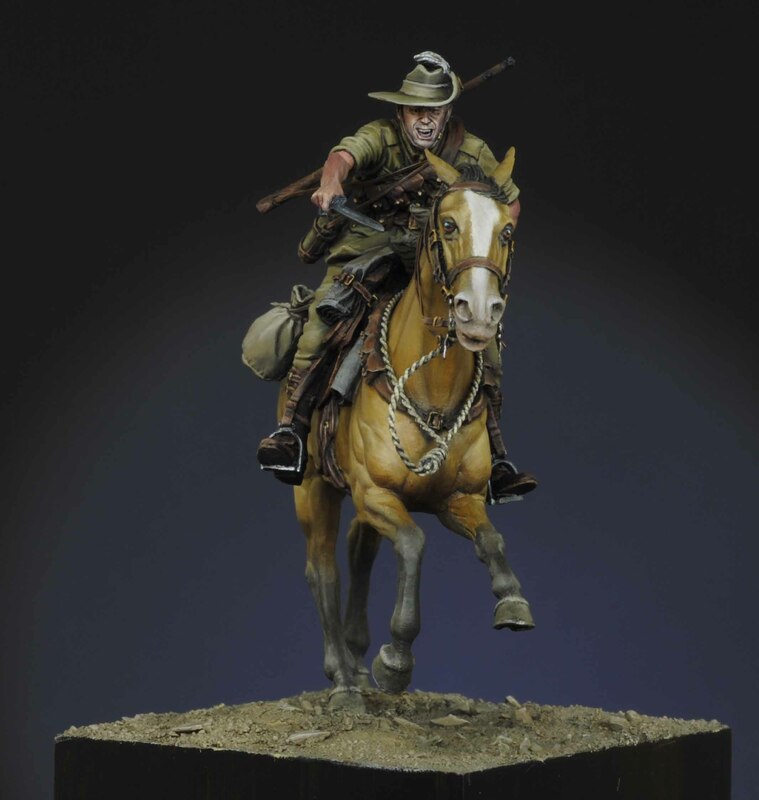 Sculpted by Nino Pizzichemi this is another outstanding figure in the cavalry range (although the ALH are strictly speaking Mounted Infantry, but I’ll come to that later!). I briefed Nino to sculpt this based on the famous charge on the 31st October 1917 as part of the Third Battle of Gaza, and I hope you’ll agree that he’s done a fantastic job. In 1917 the Middle East campaign had moved into Palestine and following the Second Battle of Gaza the British faced the Turkish army which was entrenched between the city of Gaza and Beersheba which was 46 miles to the South-East with both forces concentrated in front of the city. 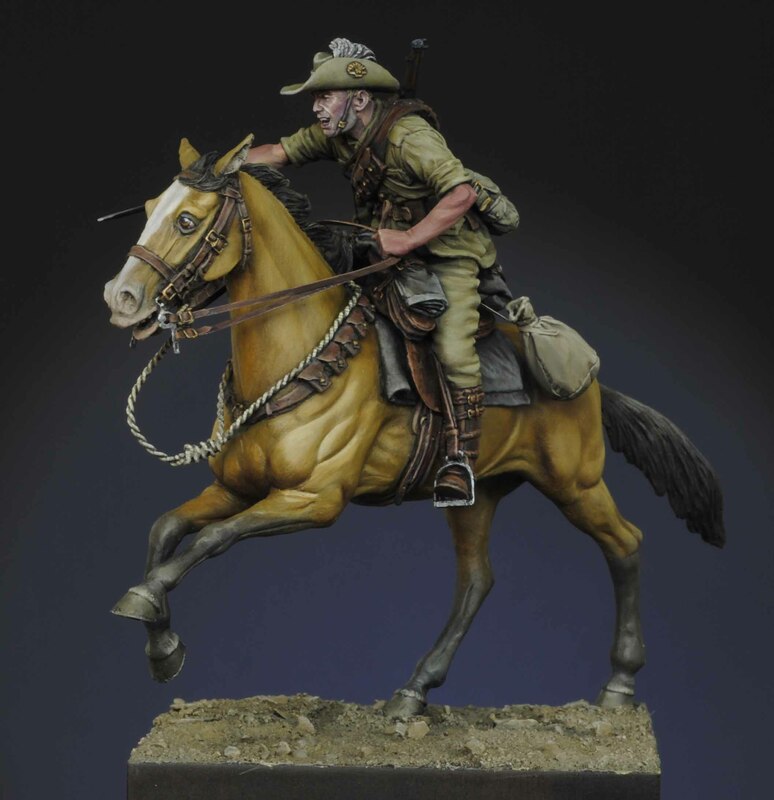 The British forces were commanded by General SirEdmund Allenby, while the Australian Light Horse was part of the Desert Mounted Corps under the command of Lieutenant General Sir Harry Chauvel. One of the immediate concerns for Chauvel was finding sufficient water for the horses of his command, using a process of elimination Beersheba was identified as the best option and a deception campaign was implemented to keep the Turkish defenders near Gaza. Beersheba was defended by 1,000 Turkish infantry, 9 marchine guns and 2 aircraft. Allenby had a force of over 40,000 troops, but the defenders were helped by difficult terrain and had dug-in behind wire. On the 31st October the British attacked and succeeded in pushing the Turkish defenders but they still held the wells. 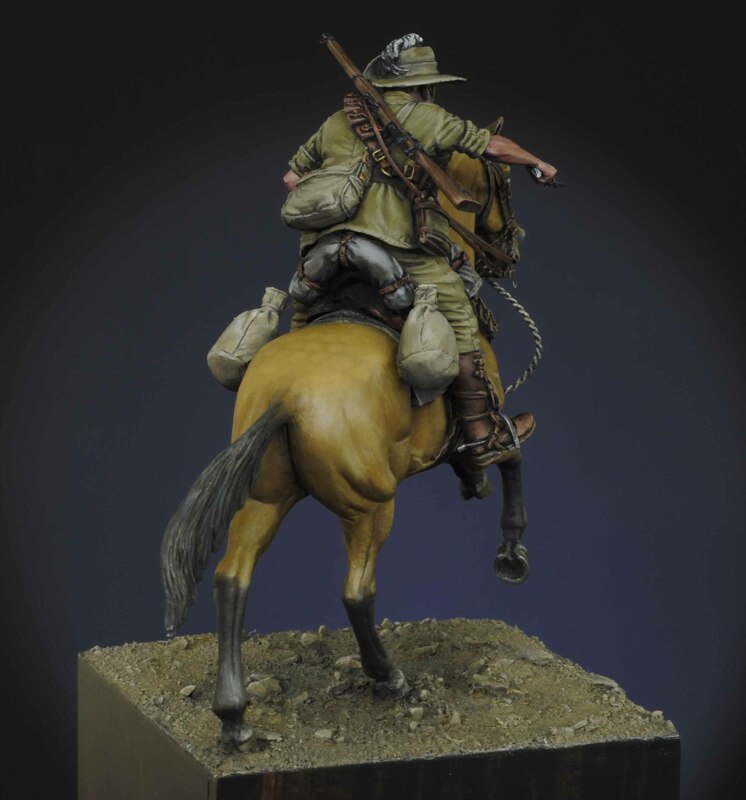 Following a day of tough fighting Chauvel decided to use the 4th Light Horse Brigade to attack the final defensive post,General Grant gave the order personally to the 12th Light Horse Regiment: “men you’re fighting for water. There’s no water between this side of Beersheba and Esani. Use your bayonets as swords. I wish you the best of luck”. The Light Horse were equipped with rifles and held their bayonets as swords, which would have been more suited to a cavalry style charge. Fortuitously their bayonet tips had been sharpened on the orders of Major General Hodgson, on 26 October*. Thirty One Light Horsemen were killed in the charge and 36 were wounded. Some originals from the Brigade who had enlisted in 1914 such as Edward Cleaver and Albert “Tibbie” Cotter, the famous Australian cricketer, were killed. 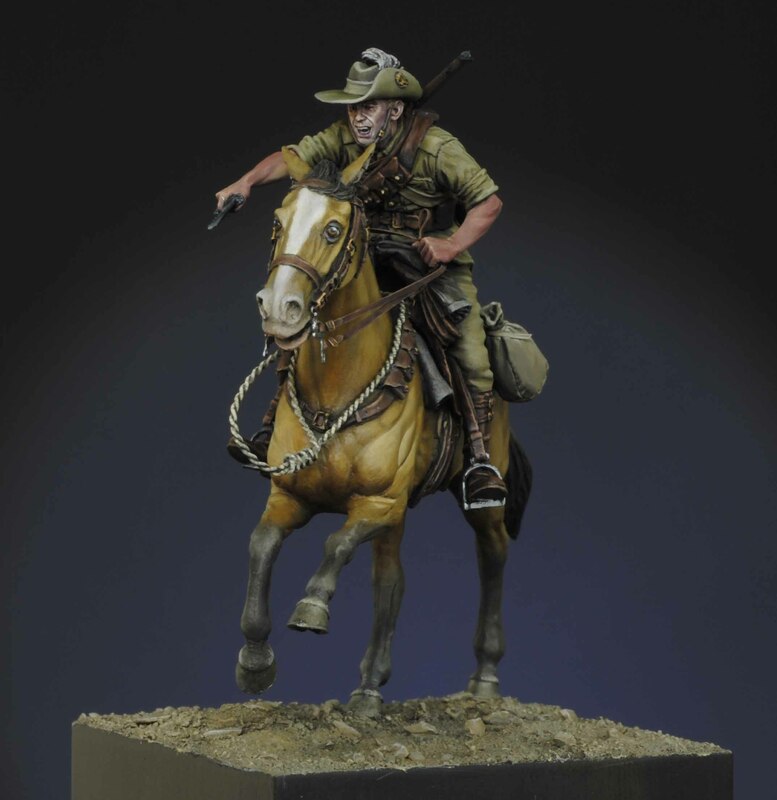 The next morning Private Keddie rode over the ground to see if any of the horses could be found roaming but he recorded only seeing dead carcases. Keddie: “We were sent looking for the horses whose riders were killed so we made for the other side of the town where several other light horse regiments were . . . met some friends in the first light horse and yarned for a while they asked me what it was like in the charge gave them a full account”. 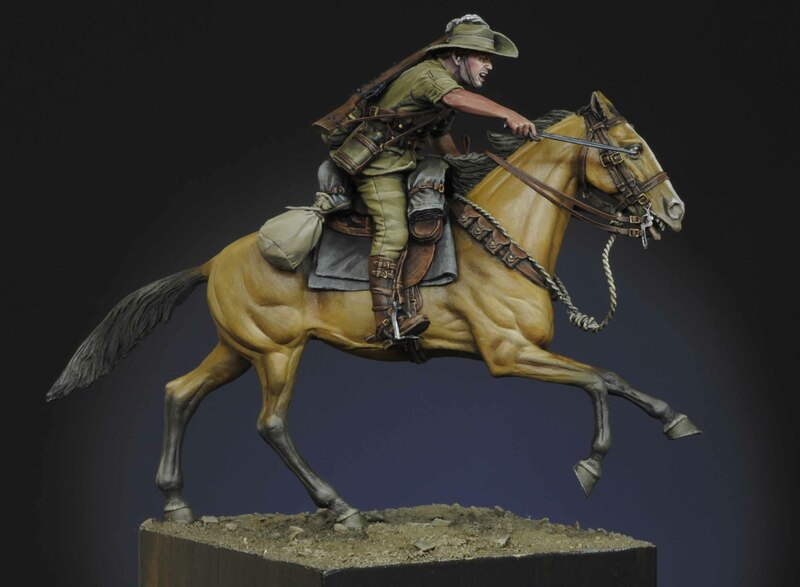 I wanted to convey the action at Beersheba and the fluidity and motion of both horse and rider in a similar way to how this had been completed for both previous figures in the cavalry series. We used the bayonet as the weapon to represent this particular battle and to commemorate this charge. Indeed, Nino has done another spectacular job and I’m delighted with the result, I asked Alex Long to paint the box art and he’s done a wonderful job. In total its another great project and collaboration. I’d like to thank both Nino and Alex for their fabulous work, and I hope the modelling community love it as much as I do. The painted figure will be at Euro Miniature Expo on the 22nd and 23rd September, where the figure will be available to purchase, so I hope you come along and see it ‘in the flesh’!